Not too many wine lovers are overly excited about tasting Australian wine (including myself), but how wrong this attitude can be! I had the opportunity to taste some very fine wine from Tahbilk, one of the members of Australia’s First Families of Wine, and it was just mind-blowing. Most people regard Marsanne as the lesser partner of Roussane. I had tried a few 100% Marsannes before and didn’t really think much of them. 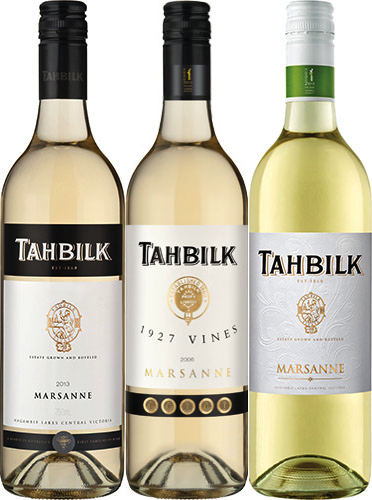 I had heard of Tahbilk, and that it has the largest planting of Marsanne in the world, but had never tried the wine, so I was really looking forward to the tasting. By the way, Tahbilk also has some of the oldest vines in the world. 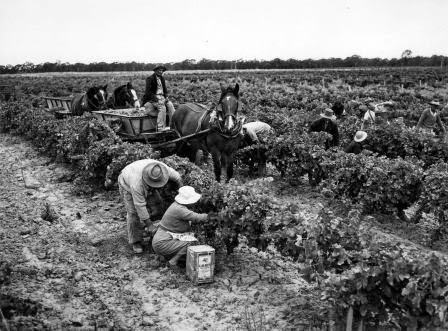 The 1927 in Tahbilk 1927 Vines Marsanne is the year when the vines were planted (87 years ago). The vines for the Tahbilk 1860 Vines Shiraz are 154 years old. As usual with Hong Kong Wine Society tastings we didn’t know the order of the wines, and Alister wanted us not only to identify which three Marsannes were made from the older vines, but also the vintage of all of them. His hint to us: the entry level one was made at low temperature in stainless steel tanks to retain the flavour, while the 1927 Vines was picked early to retain the acidity, fermented with no temperature control and relied on bottle age to develop into a complex, textural and mineral-rich wine somewhat similar to a Hunter Valley semillon. Both Tahbilk’s Marsannes were indeed full of surprises. Instead of being alcoholic, fat and bland, they were light, refreshing and delicious. The younger ones were more on the floral and citrus part of the spectrum, gradually evolving into a spices, honeysuckle and dried fruits bouquet as the wine aged. The 1927 Vines Marsannes were crisp, mineral and delicate. If I have to use one word to describe them, it would be 'elegant'. The 1860 Vines Shiraz is even rarer. Tahbilk used to produce about 200 dozen back in 2007 but the vines never really recovered from a frost attack and now the production is only about 100 dozen. After maturing in oak for 18 months, the wine is further aged for four yeas in bottle before release. Again, it is elegant and complex. The 2008 is too young to drink and the 2003 still has a long life ahead. Apart from the wine, Alister is equally proud of his conservation efforts. Through re-vegetation and investing in carbon reduction schemes, Tahbilk first achieved carbon neutral status in 2012. Alister’s aim is for the operation to be naturally carbon neutral (ie, no offsetting of carbon emissions) by 2020. Tahbilk is located in the Nagambike Lakes wine region about 90 minutes drive from Melbourne. It is the only wine region in Australia (and one of only six in the world) where the meso-climate is influenced by an inland water mass. The soil is also unique because of its high iron oxide content. Wine is an expression of place, and Tahbilk wine certainly reflects its terroir—an interaction between climate, soil, vines and the dedication of the people. Tahbilk is available from Armit Wines, limited stock only. Thanks to Chris Robinson for introducing Tahbilk. 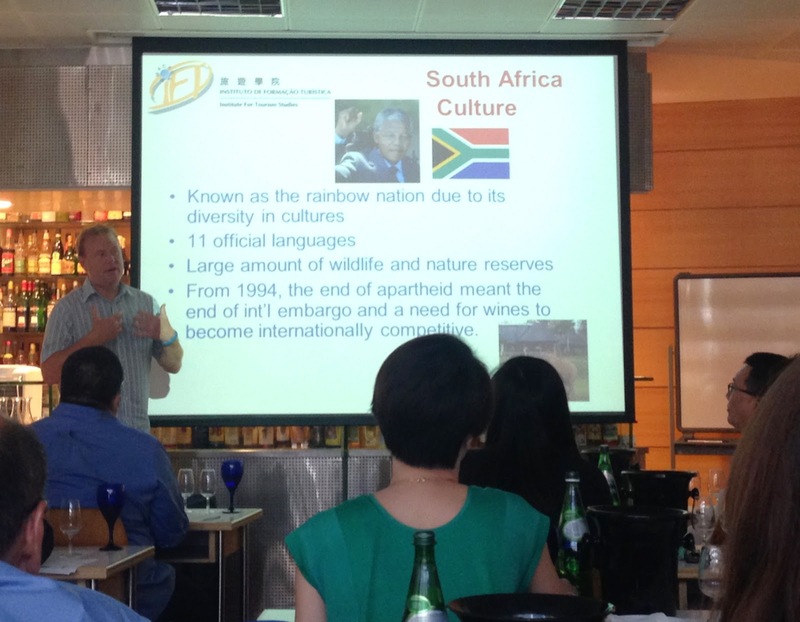 Another opportunity to taste South African wine, this time a masterclass at IFT Macau (Macau Institute of Tourism Studies) led by Richard Kershaw MW, an Englishman who is now making his own wine in Elgin, South Africa. Richard called this masterclass 'South Africa New Kids on the Block' because the winemakers are based not in the classic wine regions of Stellenbosch or Franschhoek but in cutting edge areas such as the cool Elgin and Hemel-en-Aarde and the Mediterranean Swartland. Moreover, these winemakers don’t own vineyards and some not even wineries (they share wineries). They work with growers and source grapes from the best, mostly smaller and older, plots. These winemakers are also small scale operators, only make a few wines, most of them only two. Richard summed it up by saying that not owning land or wineries lowers the barrier of entry and therefore presents an opportunity for new winemakers to make something unique. These new kids, most in their mid 30s, focus on offering the best wines made from the best grapes. The wines were divided into three flights. The first was white blends. Richard explained that a wine called a white blend tends to be lower quality, easy drinking and mostly box wine, but these winemakers try to make a point that white blends can in fact be decent. The blends are not Bordeaux SSB (Semillon-Sauvignon Blanc) but from a myriad of grapes with no dominant variety. While some are field blends form old vines, other winemakers source grapes from five or more vineyards to make a few barrels of wine. David Aristargos 2013: Only six barrels were made. This is a blend of Chenin Blanc, Viognier, Rousanne and Clairette sourced from seven vineyards. The wine is fresh, laden with fruit purity and has a concentrated mid-palate adding complexity. Winemaker David Sadie (no relation to Eben Sadie) is a member of the Swartland Independent and one of my favourite winemakers. He started with only 713 bottles of Aristargos in 2010 and now makes four wines of about 4,000 bottles. Available from Vincisive. Rall White 2013: A Chenin Blanc, Verdelho, Chardonnay and Viognier blend. Chenin’s refreshing acidity gives the wine the backbone and minerality to support the floral notes and spices of the other varieties. Donovan Rall is another member of the Swartland Independent but some of the grapes of this wine were actually sourced from Stellenbosch. He makes only two wines (a white and a red), each only a few barrels. Thorne and Daughters Rocking Horse Cape Wine Blend 2013: A blend of Rousanne, Chardonnay, Semillon and Chenin Blanc, this is another complex wine with a herb garden spicy aroma and a creamy palate. The wine takes its name from the rocking horse that John and Tasha Seccombe made for their eldest daughters using old oak barrel staves. John studied winemaking at Plumpton in the UK (where I also received my winemaking training) so I’m particularly proud of him. And yes, you guessed right, only 3-4 barrels were made. Kershaw Elgin Chardonnay Clonal Selection 2012: From the coolest region of Elgin in South Africa, this wine is restrained and elegant and the oak fermentation and ageing (40% new oak) adds complexity. Richard is very precise and aims to create clonally selected, site-specific, cool climate wine from noble grapes. This Chardonnay is made from Clones CY97, CY95 and CY76. You will be able to buy it from Vincisive soon. Alheit Cartology 2013: 88% Chenin Blanc sourced from four vineyards and blended with12% Semillon from old vines, this is a fine wine with good concentration and ageing potential. Owners Chris and Suzaan Alheit work with Rosa Kruger, a highly respected viticulturist in South Africa who is a pioneer in discovering forgotten old plots. This wine, Cartology, meaning the study of maps, is a tribute to Rosa’s work. The good news is that the wine will be soon be available in Hong Kong from Vincisive. Testalonga El Bandito 2013: Love it or hate it, this is made from 100% Chenin Blanc with prolonged skin contact (I mean weeks!). It is two shades deeper in colour, structured with a bit of tannin, nutty yet floral and fresh, reminding me of Georgian qvevri wine. Someone in the audience said "cider" which was certainly not wrong. Testalonga is the own label of Craig Hawkins, winemaker at Lammershoek in Swartland. The last flight was Pinot Noir and Syrah from the cool regions next to the Atlantic coast. JH Meyer Signature Pinot Noir 2013: A charming, fruit driven wine with a good balance. Winemaker Johan only makes two wines, about 1,000 bottles each. Crystallum Cuvee Cinema Pinot Noir 2012: Red fruits, hint of floral and spices, certainly a wine with depth and ageing potential. The father of this team of brothers, Peter Finlayson who put Walker Bay Pinot Noir on the world wine map, would be proud of sons Andrew and Peter-Allan. Kershaw Elgin Syrah Clonal Selection 2012: Another precise, clonally selected wine from Richard using Clones SH9c and SH22. A subtle wine with black fruits, white pepper, spices and a hint of vanilla from the 50% new French oak. Soon available from Vincisive. These wines are all good quality. But what I really like and appreciate is the commitment of the winemakers (often supported by their wives). They are not making crowd-pleasing wines but rather wines that respect and reflect their origins. These 'kids' are pursuing their dreams and making wines with their hearts, and we should applaud them. Ningxia, the next big thing in China’s wine world? I’d heard so many things about Ningxia so I was delighted when I finally got the chance to see it for myself. In my 12 day visit in late September last year, not only was I able to visit a few wineries, but I also attended the 2013 OIV (International Organisation of Vine and Wine) Academic Conference, judged at the Ningxia Wine Competition, tasted grapes at several vineyards, and crushed two tanks of Merlot at Silver Heights. So what do I think of Ningxia? In short, good potential for making outstanding wine but owners need to work on vineyard management and cellar hygiene. Ningxia is adjacent to Inner Mongolia with Helan Mountain forming the border. The eastern slope of Helan Mountain lies within Ningxia and the western slope in Inner Mongolia. Most vineyards (at least the quality ones) are located on the slopes of Helan Mountain, about one to two hours drive from Yinchuan, the capital of Ningxia. Some vineyards are as high as 1,000m altitude. Yinchuan, about 800km west of Beijing, has a continental climate with summer temperatures reaching over 32ºC and winter temperatures falling as low as -20ºC. It is dry with annual rainfall of only about 200mm, but luckily there is plenty of water for irrigation from the Yellow River. The advantage of the continental climate is the high diurnal temperature range during the growing season. 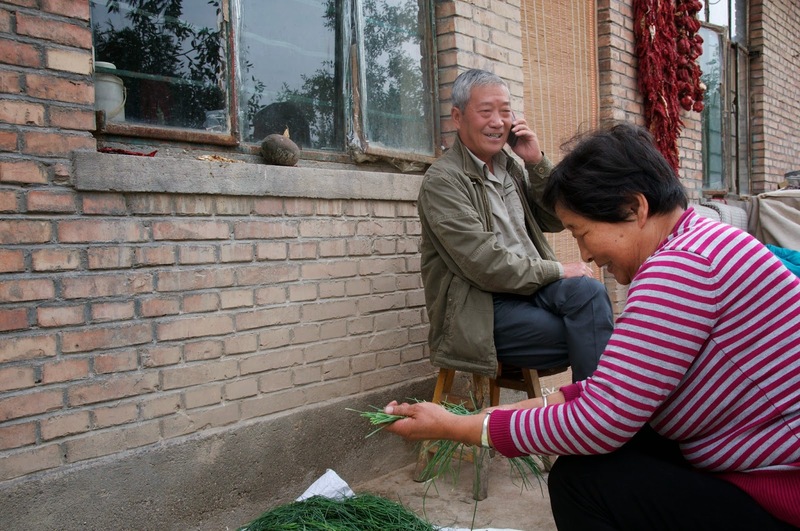 In Yinchuan the average high in July is 30ºC and the average low 18ºC, while average sunshine hours are 3,000 per year. Grapes ripen at a nice pace while still retaining their acidity, a prerequisite for making good quality wine. Dry weather also results in low disease risk, especially from mildew which is a big problem on the eastern coast of China. Soils are predominately free-draining gravels with various clay and schist components around the region, again ideal for vine growing. 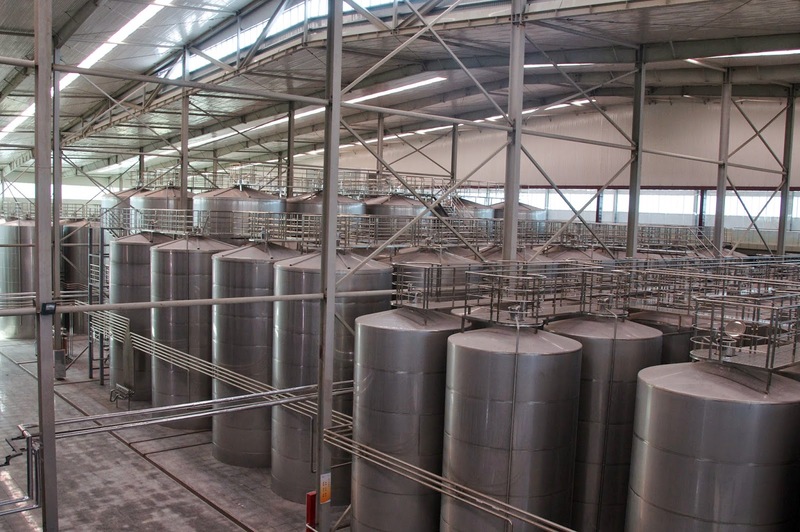 Big wineries like Great Wall, Changyu and Grace were buying grapes from Ningxia to make elsewhere long before they established their bases here. The main downside is the bitter cold and dry winter conditions that force growers to bury their vines under soil in winter to protect them. However, this is not foolproof. The vines have to be bent down every year, which shortens their life, and up to 10% may die every year during the process. Brett Richardson, viticulturist of Pernod Ricard Helan Mountain, said vines buried under soil are also prone to infection through pruning wounds. Having said that, Dr Tony Jordan, who has tramped all over China to identify the ideal area for setting up a sparkling wine vineyard for Moet Hennessy, reckons that if the vines can produce outstanding grapes their relatively short life is a fair price to pay. He established Domaine Chandon for Moet Hennessy in Ningxia. It opened early this year, with a great view of Helan Mountain. With the advances in vineyard management, surely there must be a better way of protecting vines from the harsh winter? In fact, I was wondering about going back to the basics of planting low bush vines like in Spain or Southern France. Instead of bending the trunks of vines so as to be able to bury them under soil, the soil could instead be pushed up to cover the crown. OK, this may have other consequences, such as spring frost risk, but at least the vines would be stronger and more resilient. Not only that, it is labour intensive to bury the vines in winter and dig them up again in spring so vineyard operation cost is high. Pushing up the soil would be cheaper. I was surprised to find that the average price of grapes is more than double that in South Africa (HK$7,000/ton vs HK$3,000/ton) and, according to Debra Meiburg MW, certainly more expensive than in Sonoma. At the OIV Conference, Mr Li Hua, Vice President of Northwest A&F University suggested training the cordons at ground level, adopting a similar thought to mine that soil could then be pushed up to cover the cordons instead of bending the vines. I would love to see some proper research done on this issue in Ningxia. I wonder if viticulturist guru Dr Richard Smart might be interested? The mostly planted varieties in Ningxia are red Bordeaux varieties: Cabernet Sauvignon, Merlot and Cabernet Gernischt (aka Carmenère) because of the preference of Chinese consumers towards Bordeaux wine. I wonder if these are really the best choices. Both Cabernet Sauvignon and Carmenère are late ripeners so perhaps not the best in areas with a short ripening season. There is some Syrah in Ningxia but the the vineyards I visited were badly managed. The big bunches were hidden among leaves and the vines looked sad. At end of September, the grapes still tasted fairly green with perhaps 11% potential alcohol. However, I do believe Syrah, with proper vineyard management, could thrive in Ningxia. I can imagine it being similar to the Syrah from Elqui in Chile. Dr Qiu Wenping from Missouri State University reckoned Malbec would also be a good candidate. White grape varieties, especially the aromatic ones, would also be suitable. Some of the best white wine I tasted in Ningxia was Welschriesling (貴人香), light and refreshing. I think Muscat could be interesting, and so could Verdelho. Sadly, white wine has not yet taken off in China so most growers still concentrate on the red varieties, especially Bordeaux ones. 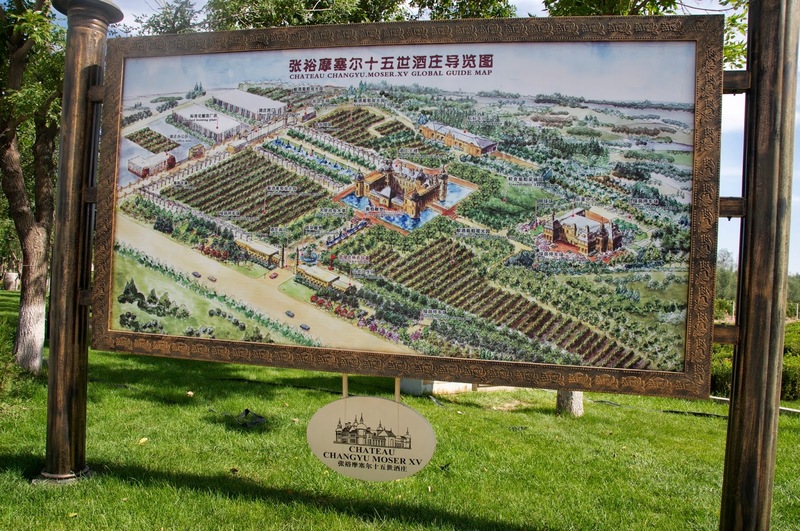 The state farm group Ningxia Nongken (農墾) has developed a nursery, with nearly every variety under the sun being cultivated. They have ambitious plans (who doesn’t in China!) to produce three to five million young vines per year. Let’s hope some growers will take up some interesting varieties. 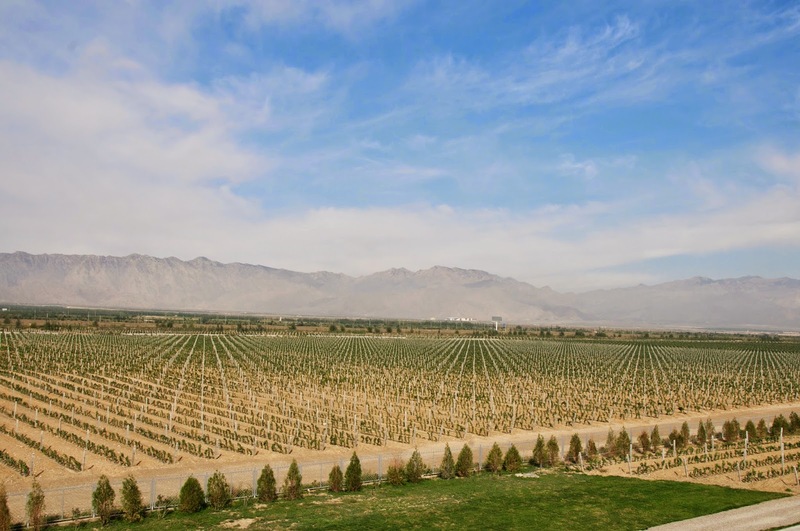 After visiting vineyards and wineries and tasting some wine, I concluded that Ningxia still has a long way to go before realising its full potential. Starting with vineyards, management needs to be improved vastly to produce quality grapes. Apart from the training concerns discussed earlier, the immediate issue is virus infection. Over half of the Cabernet Gernischt is infected with leafroll virus but it appeared that growers were not aware of it. 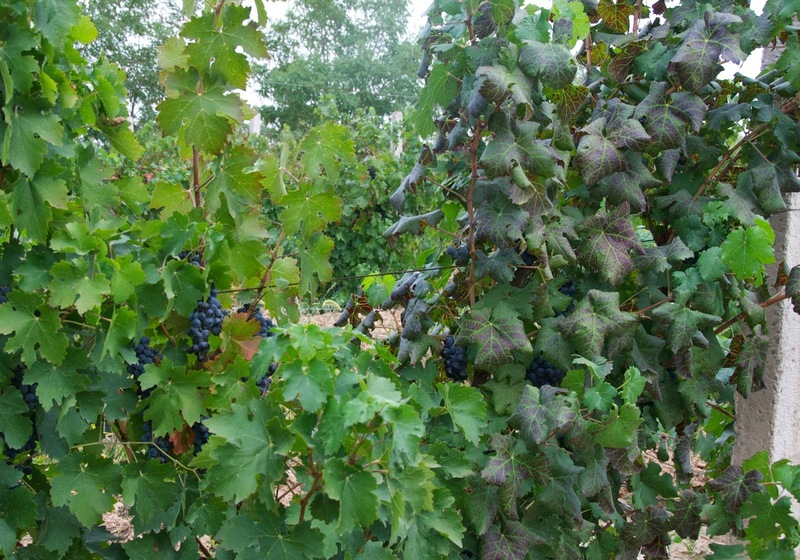 The vines have red leaves, an indication of the virus, but growers seemed to believe this was a characteristic of Cabernet Gernischt. Dr Qiu conducted research back in 2008 and confirmed that over 60% of the vines were infected. No wonder the wine tasted green and musty. 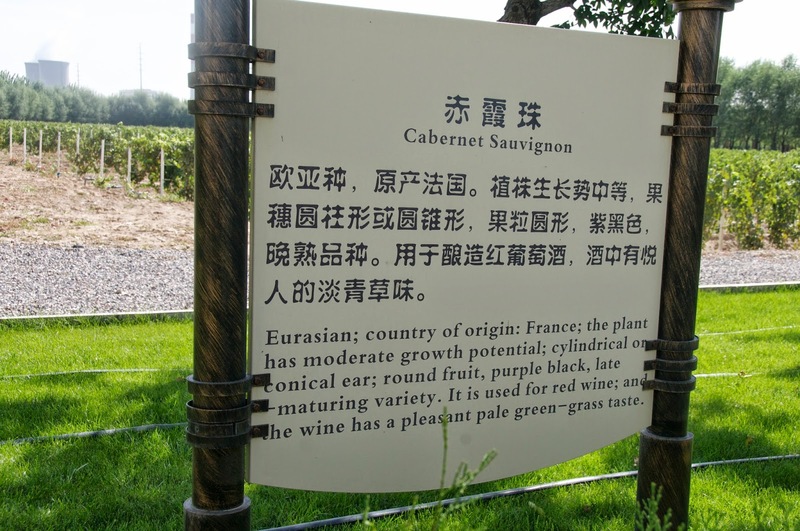 At Chateau Changyu Moser XV, with its grand castles, a poster in front of the Cabernet Sauvignon plot described the wine as having “a pleasant pale green grass aroma” (悅人的淡青草味). Well, it should be blackcurrant, if ripened properly. Green grass aroma is unripe Cabernet Sauvignon, I’m afraid, and not something you want to advertise. As with most vine growing regions in China, Ningxia has its share of conflict between growers and winemakers about yield versus quality. This problem will not go away if contracted farmers continue to be paid by tonnage. Obviously they want to maximise yield. Just look at the size of their table grapes, they can be as big as strawberries! I witnessed how Emma Gao and her father from Silver Heights charmingly liaised with growers on yield, but at the end of the day there is little they can do. Helan Mountain, owned by Pernod Ricard is more farsighted. After splitting with their joint venture partner they are now managing the vineyards in a different way, with farmers being paid for following instructions rather than on tonnage. This is certainly the way to go. Good quality may be a prerequisite of good quality wine but winemakers can still ruin the fruits through poor cellar hygiene and careless handling. At the Ningxia wine competition I dare say 30% of the wine we tasted was faulty and another 30% showed bad winemaking, from reduced and oxidised to brett and corked. The 12-person judging panel consisted of experienced writers and professionals from the UK, France, Australia, China and myself. We were all making faces and noises during the tasting. One of the comments I made to winemakers was that most of their wines were over-oaked. Delicate fruit aromas were overpowered. This is probably because of the current preference of local consumers, who rightly or wrongly believe that any wine aged in wood must be expensive and therefore must taste good. Balance is the key to all good wine so I hope both winemakers and consumers in China will come to appreciate this soon. 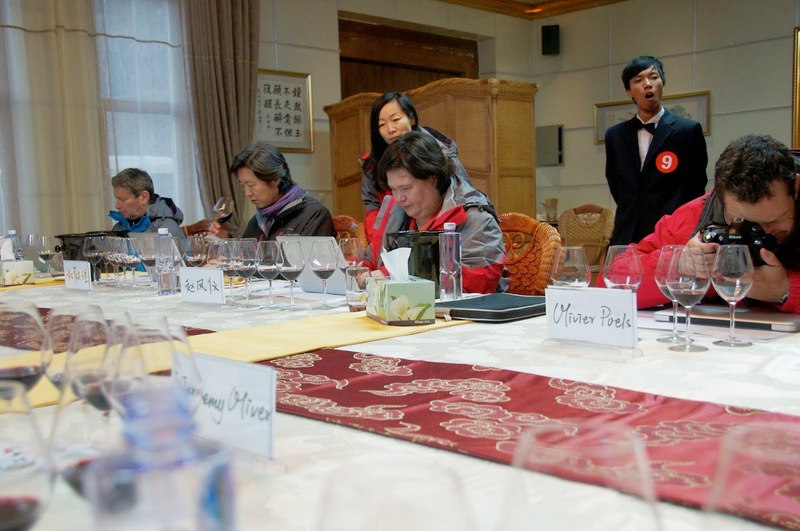 Ms Zhang Jing (張靜), winemaker at He Lan Qing Xue (賀蘭晴雪) asked if we could taste the terroir in the wine. My answer? Terroir is a combination of climate, soil, grape varieties and man’s efforts. 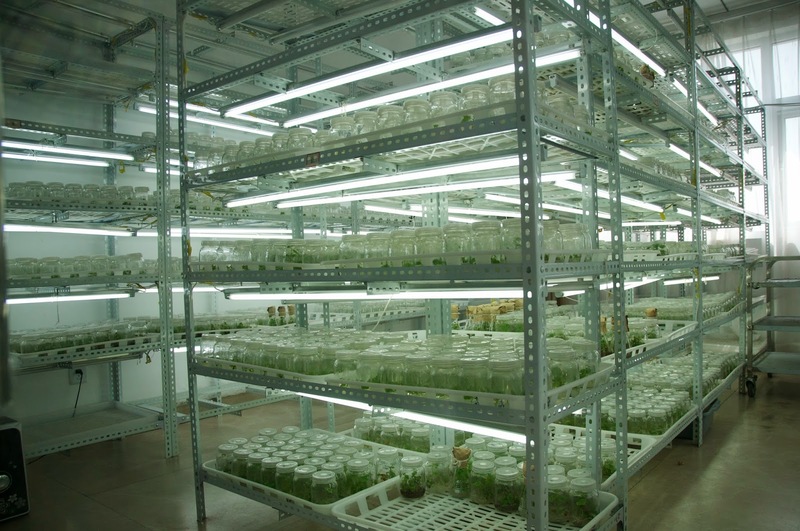 Ningxia is still at the experimental stage, trying to find the right varieties and clones that can grow in the dry and continental climate and match the soil. Too much oak also doesn’t help: it masks the expression of the fruit, which is the heart of terroir. I think terroir will only come through after all these building blocks are in place. Rome was not built in a day ... and France has been making wine since Roman times. There is only one vintage per year and I think my fellow Ningxia winemakers have to be patient about laying claim to an identifiable ‘terroir’. But I’m heartened to see that winemakers are willing to learn. At first, most of the judges were reluctant to criticise the wine but after I made the first critical comment, everyone chipped in. To their credit, winemakers listened and asked even more questions. At the end of the ‘grilling session’, we urged them to try different wines from other countries (not only China and France). Learning wine comes from tasting and seeing more. 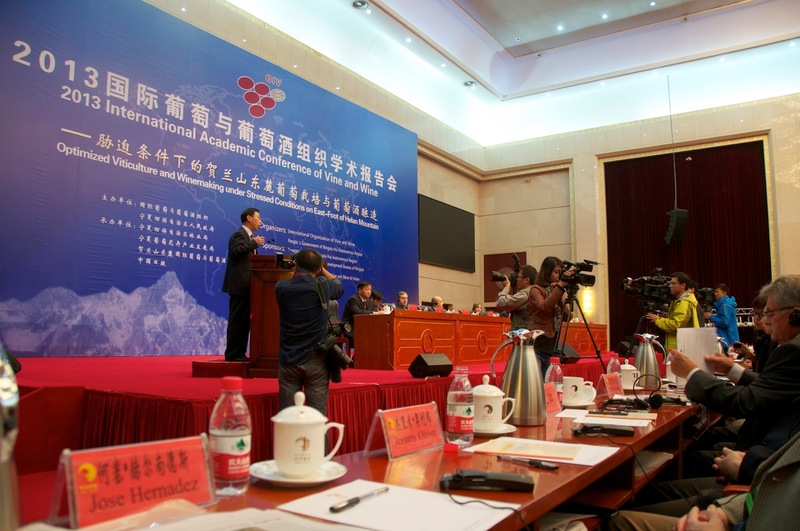 The Ningxia Government is very supportive of the wine industry. 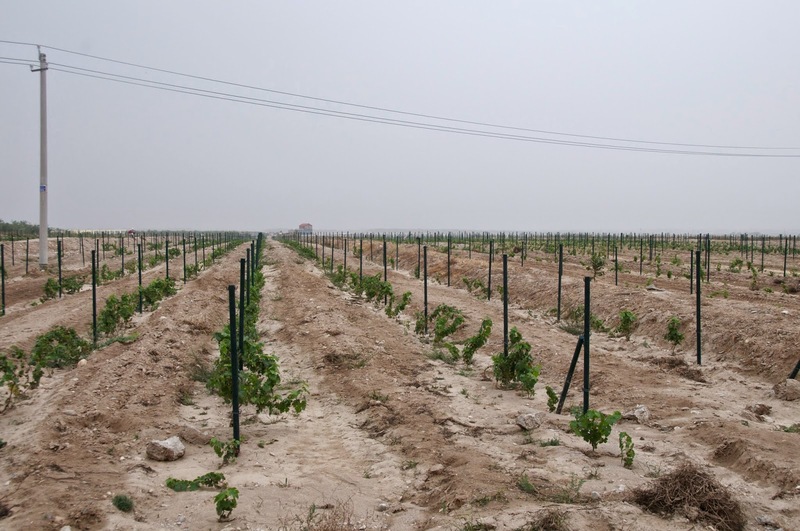 They have ambitious plans to develop Ningxia into a ‘million mu (66,000 ha) vineyard corridor’ and are giving incentives to wineries and even non-wine related companies to develop vineyards and wine tourism businesses. Ningxia was also the first region in China to be accepted as an official observer at the OIV in 2012 (the other was Yantai but that is at the municipal level). Hopefully, with both government and OIV support, Ningxia will have better access to vineyard and winery management in order to improve its wine quality. 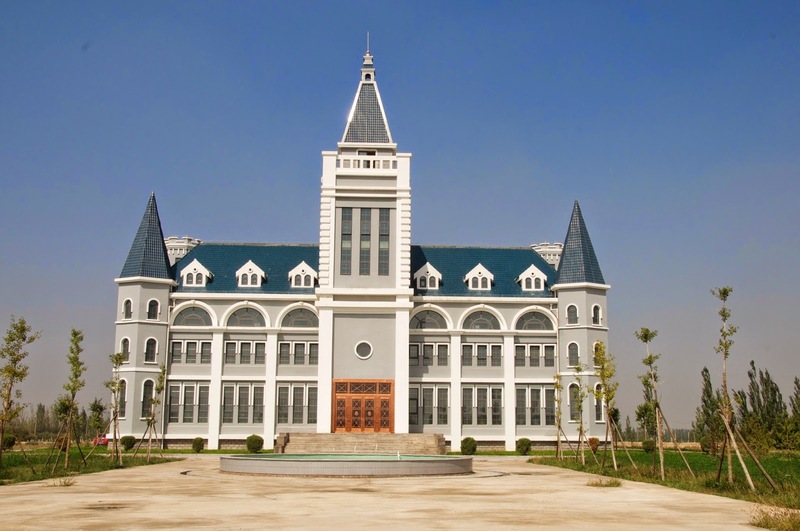 ine educator and writer, joked that a tour of Changyu is like walking into Ikea —it’s one-way, big and never-ending. Great Wall is building another massive establishment with 3,000ha land and Rmb310 million of investment (yes, most wineries like to boast about how much money they have spent or will spend). St Louis-Ding, though a relatively small outfit, still has a Disney-like castle with a sad looking fountain in front that makes it look more like a movie set where there’s only a facade. This is all good but my point is that wine should be at the core of wine tourism. If the region builds a reputation for good quality wine, wine lovers and friends will like to see it, and tourism will then naturally develop. All these big investments in Ningxia, from my point of view, are like a child trying to run without first learning how to walk. Projects that are built on expectation rather than competency are often short-lived. Various wine routes in South Africa, most notably Stellenbosch, and California (eg. 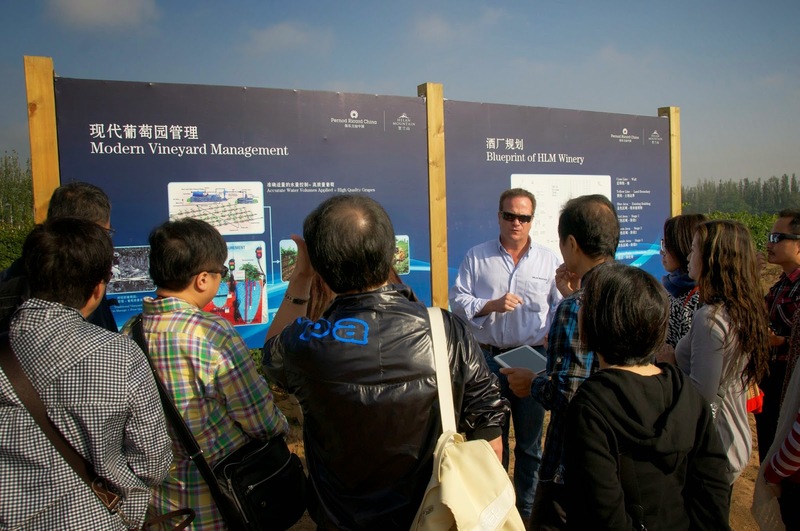 Napa and Sonoma) are successful wine tourism case studies that Ningxia should learn from. 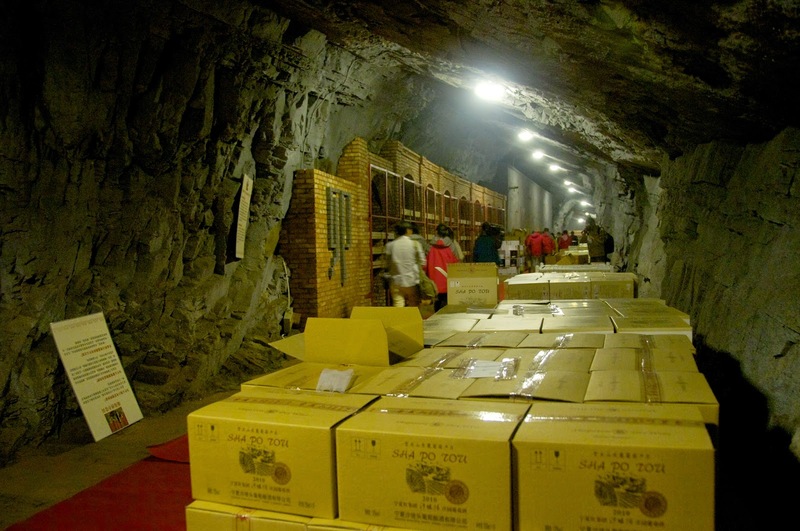 To illustrate, the government was keen to show judges the latest wine tourism attraction: a defunct mine turned into a wine cellar in the middle of the mountain. We were bused there in the afternoon to walk a 1km tunnel at below 10ºC (we were all given jackets) where boxes of wine from various wineries in the region are stored. At the end of the tunnel is a small table and some shelves, presumably where wine tastings could be conducted. But who wants to taste wine at 5ºC? Anyway, the joke was that the entourage of some 30 people including staff, cameramen and guests walked all the way to the end of the tunnel, expecting a speech or some introduction, but the only words the chief said were ‘let’s go back’! We were secretly thankful that we didn’t need to judge the wine in that freezing cold and dark tunnel, but the actual judging conditions were not much better. The room we were in, just outside the tunnel, was about 12-15ºC to start with but getting colder as time went by. The wines we judged were apparently stored in the tunnel and were at 2-3ºC at most, muting the delicate aromas of some potentially good wines. The organiser rolled out a portable heater but the room was too big for it to be effective. And it was not only we judges who had to endure the cold room (and at least we had a job to do); there were about 10 others who were not judges but had to sit there waiting for us to finish our work. They weren’t even given any wine to taste! We had no idea, and I’m sure they themselves hadn’t either, why they were there. 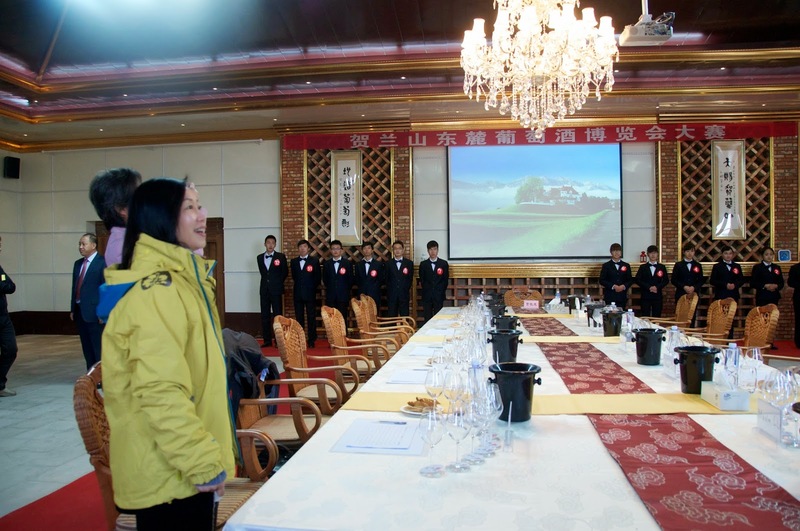 It is not only local wine giants such as Changyu and Dynasty that have made significant investments in Ningxia; foreign wineries have also noted the region’s potential. 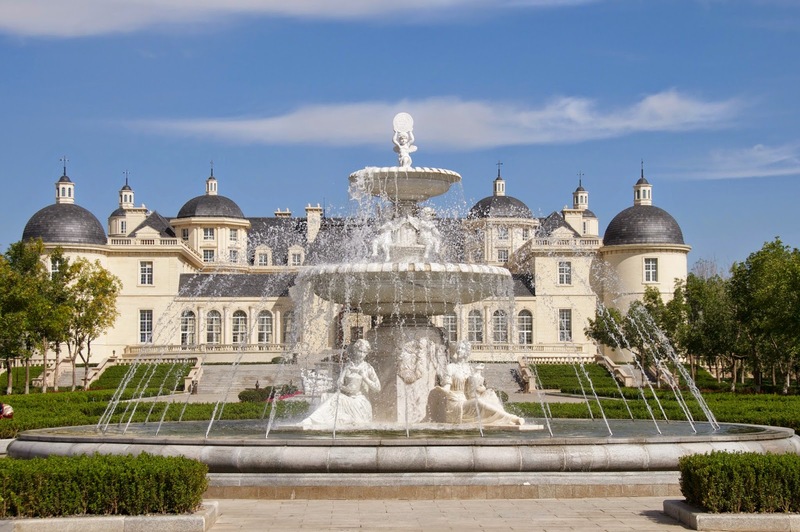 Pernod Ricard is now the 100% owner of Domain Helan Mountain, while Moet Hennessy has a joint venture with Nongken, the local state farm group, to produce sparkling wine and Austrian Lenz Moser has partnered with Changyu. Ever since He Lan Qing Xue’s Jia Bei Lan 2009 Cabernet blend won Decanter’s ‘Red Bordeaux varietal over £10’ International Trophy in 2011, Ningxia has been drawing international media attention with high profile visits from the likes of Jancis Robinson, who has four Ningxia wines out of six in her most favourite Chinese wine list (Ch. Changyu Moser XV, He Lan Qing Xue, Helan Mountan, Silver Heights). 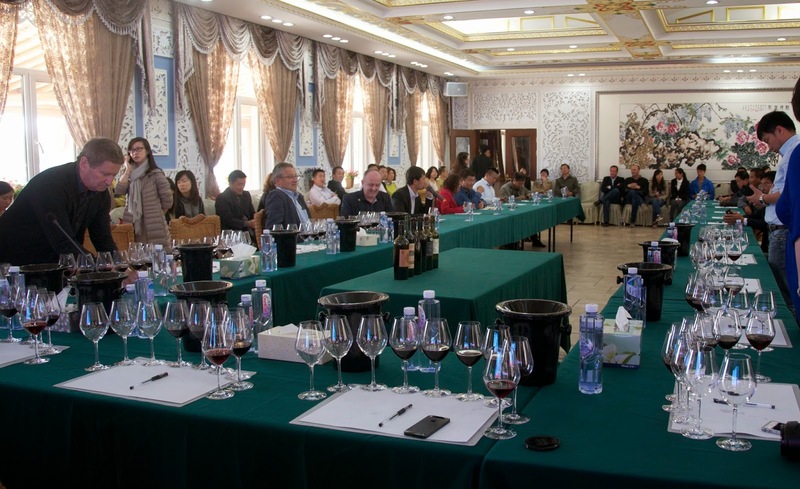 Judging at this Ningxia wine competition were several international experts including Jeremy Oliver and Nikki Palun from Australia, Anthony Ross from the UK and Xavier Mihade, Denis Saverot and his colleague from France. They all agreed that Ningxia (or Helan Mountain Eastern Slope as the government calls it), has potential although there is a lot of catching up to do. China is the fifth largest wine producing country in the world, and one of the fastest growing wine consumers. In my view, Ningxia and the west are certainly more suitable for vine growing than the east. No doubt the region will continue to attract attention and investment, both from abroad and within China. It is up to Ningxia to keep up with the expectations it has generated. I have faith in Ningxia. The soil and geography are right and the climate issues can be tackled. What the industry needs to do is to focus on finding the right grape varieties, improving vineyard and winery management, gaining experience from abroad, and widening consumers’ tasting palates. I’m sure Ningxia wine will shine one day, and I would love to be part of the process of seeing and making it happen. Most great wineries are built and improved over generations. Ningxia, you are only a toddler, so be patient if you want to grow up to become a serious player in the world of wine—but what potential you have! Fairytale-like castles with a Hollywood movie-set cellar tour to match. After tons of charming and bullying, we were finally allowed to taste one wine—I was there with five other judges from the Ningxia Wine Competition and all of us had VIP badges from the organiser. We tasted this wine with its label in Chinese that said ‘exclusively for group buying’ (團購渠道專供). Selling price Rmb1,480 and the wine was faulty. Another ambitious enterprise with 126 massive stainless steel tanks. Restaurants and all kinds of tourist entertainment are planned. Chief winemaker Jiang Tao (江濤) gave us two wines for blind tasting, a white Welschriesling and a red blend of 75% Cabernet Franc and 25% Cabernet Sauvignon. Both were very well-made. I was particularly impressed by the white. A modern European design, understated but no doubt expensive, with a panoramic view of Helan Mountain when the weather permits. Its first vintage will only be released in 2014 so we could only taste its sister wine, Chandon Australia, at the visitor centre. Anyway, with vines planted at 1,100m altitude, the full support of Moet Hennessy and the guidance Dr Tony Jordan (winemaking consultant), watch out. It might well be the first Chinese-made quality sparkling wine! 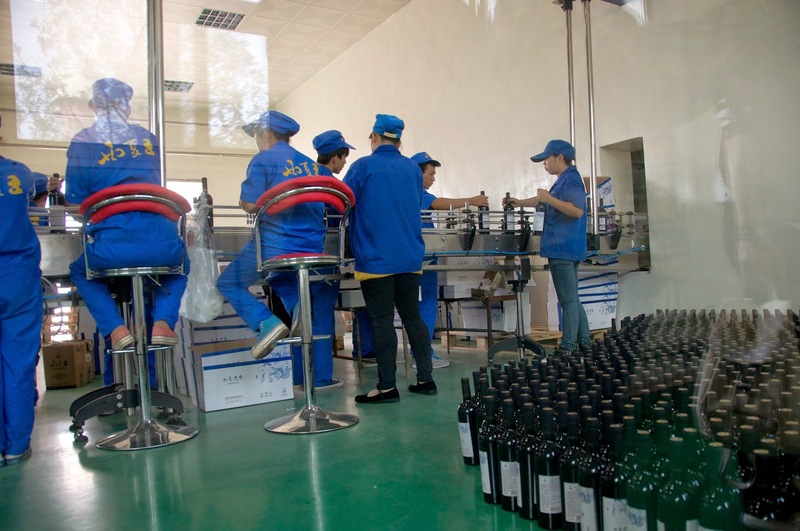 Run by Aussie duo Craig Grafton, the chief winemaker, and Brett Richardson, the viticulturist, this now 100% Pernod Ricard owned operation was the only winery that showed us the vineyard and explained to us the challenges of vine growing in Ningxia. A clean and well-maintained winery and well-made wine across the board. The barrel-fermented Chardonnay 2011, reasonably priced by China standards at Rmb270, won the trophy at the Ningxia Wine Competition. The property is a straight copy of a Disney castle. The wine is spicy with very generous use of oak and a price tag to match. 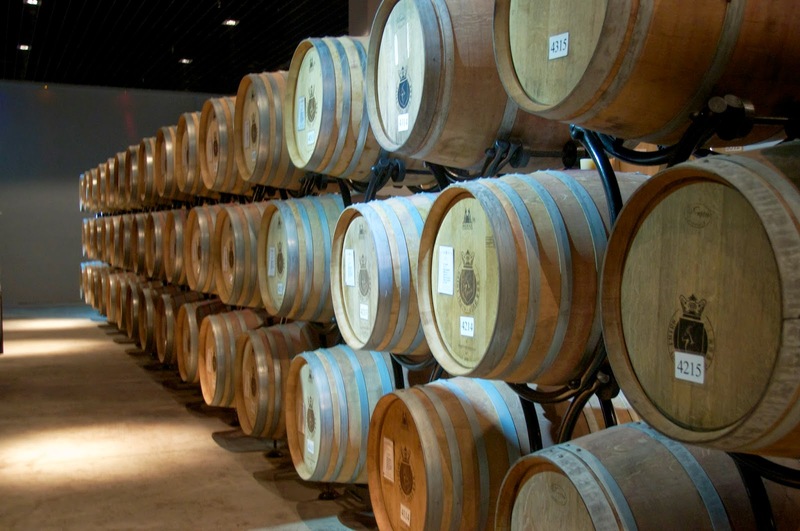 The 2011 is still in barrel and the estimated selling price is Rmb200,000 per barrel (about Rmb650/bottle). Its 2009 vintage sold at Rmb3,999. By the way, the Ding after Saint Louis is the last name of the owner. The most down-to-earth and real winery I visited in Ningxia. Exactly like being in a small family-run winery in France or New Zealand. Emma Gao (Gao Yuan, 高源), the winemaker and her father Gao Lin (高林) conducted wine tasting for vistors on the patio next to the tanks, and you can pick dates and table grapes fresh from the trees/vines. My favourite wine is The Summit 2011. It’s too early to drink now but there is concentration and structure with the right amount of oak giving it elegance. Impressive entrance with vines planted along the road leading to the property. We were shown the bottling line through a glass partition but not the winery (車間) because they were processing (health and safety issue?). There are one processing plants in operation and another two under construction, each with a capacity of 10,000 tons. At the end of the tour we were shown the display room but got no wine tasting. We bought a Cabernet Gernischt NV at 12% for Rmb400 for lunch. It tasted green.